In Japan, broken objects are often repaired with gold. The flaw is seen as a unique piece of the object's history, which adds to its beauty. Consider this when you feel broken. 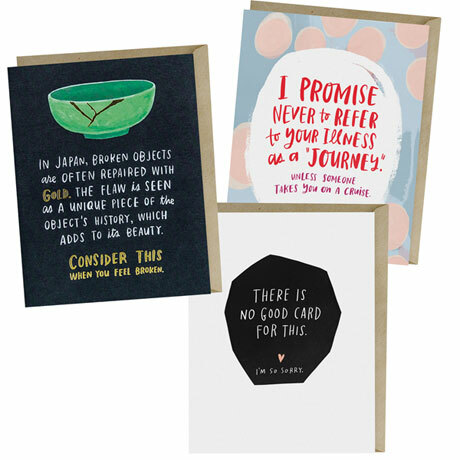 If you've ever stared at a rack of condolence cards or "get well soon" missives and thought, "None of these is quite right," our trio of unique Empathy Cards is for you. A gently humorous greeting—"I promise never to refer to your illness as a 'journey.' Unless someone takes you on a cruise. "—is sure to make a chronically ill friend smile. A loved one struggling to pick up the pieces after a loss, divorce, or other devastating event will cherish the gold foil-embellished "Consider this when you feel broken" card. And for those situations that seem to defy words: "There is no good card for this. I'm so sorry." We're offering a set of three (one of each design) blank 4¼"x5½" note cards, with kraft envelopes, so you'll be prepared to offer empathy and support when it's needed most.